Old Leafs of my anubias nana are turning yellow. I think it is Nitrogen deficiency, any other ideas. No Bga, diatoms on plants. I perform 60% water change every week, filter cleaned monthly, tank is 3 month old. I'm not expert but we all usually do 30-50% water changes. Why do you do 60% ? I change 100 lit of water every week, 50 lit of RO water is mixed with 50 lit of normal water. Check the rhizome for rotting. Check if you have tied it too tight. I just moved them to a place in tank where they might be receiving too much light, can that be a reason. Potassium deficiency first shows up in fast growing plants. I have Hygrophyla in my tank, they seem to be doing all right. This problem is only becoming visible in anubias and in crypts to some extent. This is one of the plants. It is a very beautiful tank. Sorry to hear about your anubias. I once had the same problem with anubias that had been a recent purchase. Had happened due to the poor conditions faced by the hardy plant in transportation. Hv u acquired the plants recently? They have been with me for 6 months now, although they have been through a lot. Tank changes, fluctuating co2 levels, algae attacks, you name it and you have it. My source water had very high TDS. To control this I started mixing 50% RO water. Now I am not dosing Mg, can this be due to Mg. Original Mgwas 75 ppm it might have come down to 30-40ppm. Mg at 30 - ppm is ok.
Madan I am assuming that Mg is 30 ppm I do not have a test kit. Does RO water remove nearly all Mg and Ca or brings it down to 90% as it does with Ro water, any idea. My tap water has hardness of 520 ppm or 29.07, now by RO water use it would have come down to 288 or approx 16. Again i am assuming that RO water will have a hardness of 100. .
As I do not have test kits I am relying on plant health. Younger leaves of all plants including anubias are not any signs of damage. Hence i am assuming that it is mobile nutrients that are becoming short. I am dosing P, K, iron, boron etc. The only thing I am not dosing is Mg. 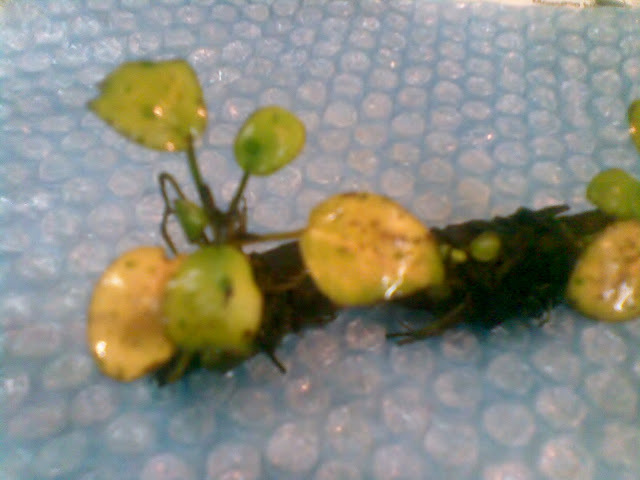 It is the older leaves of anubias and crypts to some extent that are showing signs of yellow.